Many people are concerned about the chemicals used in carpet cleaners, while others are concerned about the cost of these solutions. Unfortunately, Bissell states in its owner's manuals that only Bissell carpet cleaning products made for Bissell carpet cleaners can be used with their machines. Other products will void your warranty and may cause fire and electrical shock inside the machine. However, should you decide to make your own cleaning solution anyway, there are both natural and chemical cleaners you can make at home to use in your Bissell carpet cleaner. Test it in an inconspicuous spot first to ensure the solution won't discolor your carpet. White vinegar can be used as a household cleaning product to clean just about any surface. Fortunately, you can even use it in a Bissell carpet cleaner. To use, pour one cup of white vinegar into the Bissell's reservoir tank. Fill the tank the rest of the way with hot water. Then, use your Bissell as directed. If you have heavy stains, you can mix equal parts of white vinegar and water in a spray bottle, then spray it to pretreat stains. After about an hour, use the Bissell with vinegar as described above. 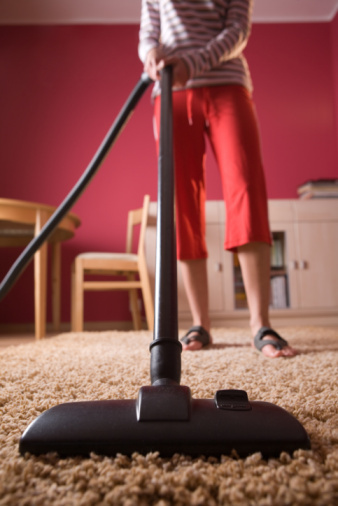 To maximize the use of vinegar in a Bissell carpet cleaner, sprinkle baking soda over your carpet first. You can even sweep it over the pile to help it fall deeper into the carpet, where the stubborn dirt and grime is. Then either pretreat the stains by spraying the vinegar and water solution, or go straight for the Bissell. When the vinegar mixes with the baking soda, a bubbly reaction will help loosen dirt and oils in the carpet. Using hot water is actually recommend by professional carpet cleaners because the residue leftover from carpet shampoos can trap more dirt later. You may be surprised how clean your carpet can actually get just by using hot water. Plus, it's an easy way to save money. To make a carpet shampoo used by many Bissell owners, mix the following: a half cup of laundry detergent (no bleach), a half cup of liquid laundry softener, one cup of ammonia and one gallon of water. Store the mixture in a large jug. This will be enough for several cleanings. Read the directions that came with your Bissell to know exactly how much cleaner to add to your reservoir. Generally, about a fourth of a cup will suffice. Be sure to shake the jug well before measuring. Afterward, if desired, you can rinse your carpet by going over it again with plain water.